Allison Sheehan Racing :: Team awarded. 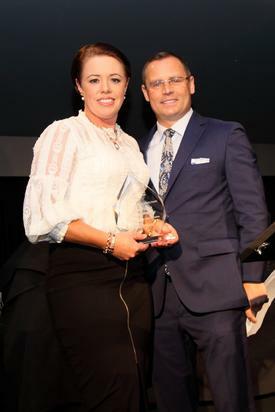 The much anticipated and well attended Cranbourne Racing Industry Awards night was held on Saturday and Allison was delighted to accept the Cranbourne Trainer Achievement Award for the most winners from less than 50 professional starters. An award in place to recognise the hard work of smaller trainers and their staff, it has been won by Allison twice from the last three years. Represented by 4 individual winners of 8 races over the course of the successful 2017/18 season, Allison is proud of the winning achievements of El Questro, Izenashark, Alonzah and She'll Strykeya. And delighted to have won races for some great people - "I've got a pretty big group of supportive owners - some have small shares, some their own - it is always really gratifying to win races with home-bred horses; their owners get a special thrill out of it." Particularly enjoyable were the metropolitan level successes recorded by Alonzah and Izenashark. Looking forward to another successful season with some lovely youngsters joining the proven brigade in the stable, Allison said that "there is always room for nice new horses but in saying that I like to keep around six in work, it's a nice number for a small stable."